This section contains information related to Norwegian Air Shuttle, flight code DY, a low-cost carrier original type. Norwegian Air Shuttle AS is a low-fare, point-to-point airline, registered on the Oslo Stock Exchange, employing approx. 620 people. In September 2002 Norwegian launched a program of low-cost domestic flights between Oslo and Stavanger, Bergen, Trondheim and Tromso using a fleet of Boeing 737 aircraft. Today Norwegian operates a total of 82 routes – 10 domestic and 72 international. 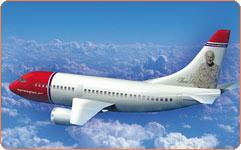 Norwegian has 20 aircraft of Boeing 737-300 with 148 seats. In 2005 Norwegian Air Shuttle AS transported 3.3 million passengers. The company’s headquarters are located at Fornebu, just outside Oslo. Norwegian Air Shuttle is listed on the stockmarket. Click to browse to the network development section of this site, featuring more more information on the network development of Norwegian Air Shuttle.